This mini-dungeon can be played as a sequel to “There are more Things in the Planes and the Earth“, but it works perfectly fine on its own as well. After having braved the weird complex and witnessed an elder thing talking to Formians, the PCs now explore a complex where the insectoid creatures represent the none-too-pleasant opposition – random events are provided as well, 4 to be more precise, Wait, Formians? Yep – stats for warriors and workers of the classic critters are provided – kudos, though the formian’s Stinger is one off regarding its damage-value. Editing and formatting are very good, I noticed no significant glitches. Layout adheres to a beautiful 2-column full-color standard and the pdf comes sans bookmarks, but needs none at this length. Cartography is full color and decent, and the inclusion of a key-less map and VTT-capable options is a big plus for me. Really annoying glitch: The text on page #2 is half transparent, making it a strain on the eyes. 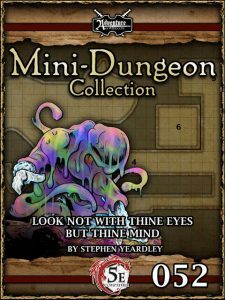 Stephen Yeardley’s latest installments of this sequence of loosely connected mini-dungeons has a diverse and fun array of foes, a neat atmosphere and generally makes for a cool exploration. That being said, the strange layout glitch on page #2 is less than pleasant to read through. The 5E-conversion, otherwise, has been handled well, though I can’t comment on who did it. My final verdict will clock in at 4 stars.